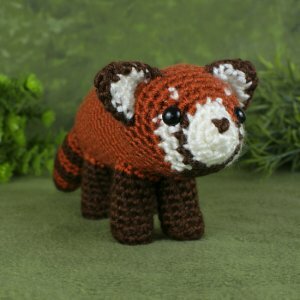 An original crochet amigurumi Red Panda pattern by June Gilbank. Red Pandas live in mountainous regions of China and the Himalayas. Like their Giant Panda namesakes, they primarily eat bamboo, but red pandas are more closely related to raccoons than to giant pandas! Red pandas are about the same size as a large domestic cat, and their thick fur and bushy tails help to protect them from the cold. Date Added: 01/29/2018 by Madeleine F.
Date Added: 03/27/2015 by Janet Y. Date Added: 07/24/2013 by Susanna V.